What Do Rita Moreno, ‘Shaft’ and an Eight-Track Player Have in Common? For two days this week, room 325 in the University of Virginia’s Wilson Hall looked more like a swap meet than a media studies classroom. On one table were back issues of Life magazine. On another were old Atari and Nintendo game consoles. On a table toward the back was a Sony Walkman and a record player, next to a vinyl version of Michael Jackson’s “Thriller” album. Welcome to MDST 3050, “History of Media,” a course taught (in two sections) by assistant media studies professors Kevin Driscoll and Keara Goin. For their final projects, students were tasked with exploring the social consequences of media change. To that end, teams of students developed historical research questions based on concepts ranging from community and identity to time, space and memory. With the help of UVA librarians, the teams were required to explore a range of media archives in search of materials to answer the questions. After analyzing the materials, the students communicated their findings through museum-style exhibits, rather than papers or presentations. The goal: To understand the unique archival challenges presented by media of the 20th century. “The hunt for appropriate artifacts is one of the joys of this project,” Driscoll said. “Given the overwhelming amount of information available through the internet, it is difficult to imagine how much of our media heritage remains inaccessible. Yet students quickly discover the gaps and blind spots in commercial services like YouTube when they attempt to study earlier periods in media history. Not only is most popular media poorly preserved, but even those materials that do turn up on the web are rarely given the context required for rigorous historical analysis. 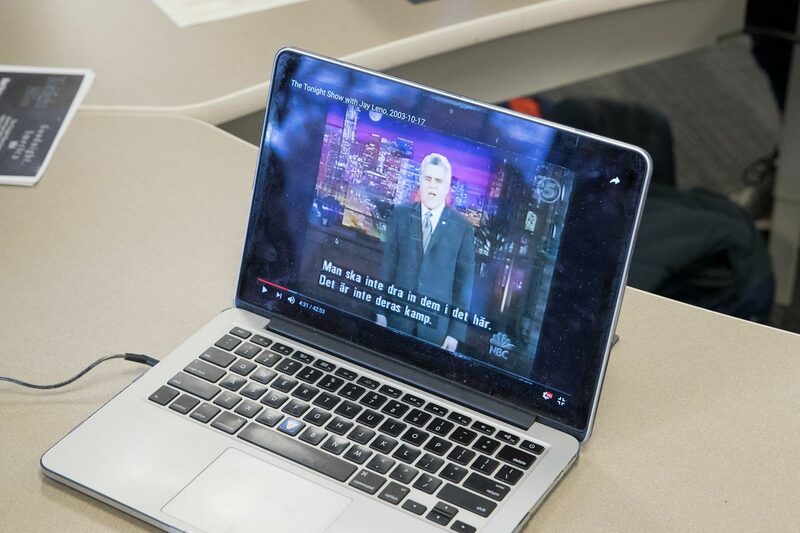 One group of students focused on the evolution of “The Tonight Show.” The team set up three laptops that played clips from hosts Johnny Carson, Jay Leno and Jimmy Fallon. Accompanying each laptop were timestamps telling viewers exactly where to find specific content, such as political jokes. 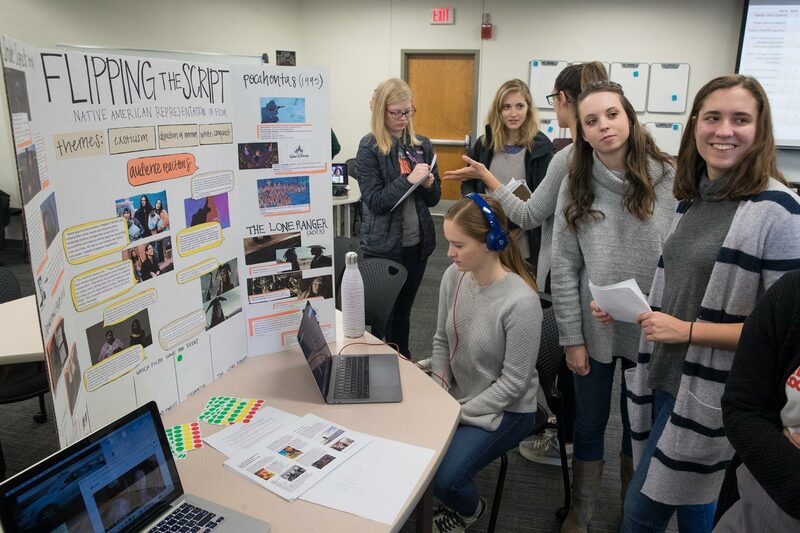 “We examined how this pillar of American culture reflected on what was going on in America at the time, and how each host brings something different to the table in terms of humor and style,” student Emily Moliken said. Another group examined Life magazine ads pertaining to femininity that ran before and after World War II. In the students’ display were bound copies of the magazine that they checked out of Alderman Library. “When I was looking through the ’60s ads, I thought I would see more change toward women – especially since the ’60s were such a revolutionary period for civil rights, second-wave feminism – so it was a little upsetting to see such stereotypical representations,” student Brielle Entzminger said. “But then we noticed that it was at least representations of women for themselves and taking care of their families, rather than buying things specifically for men. That was more encouraging, per se. A group in Goin’s class tracked the evolution of how we listen to music and how that has changed the public and private consumption of it. Their display included a phonograph, an eight-track player, a boom box, a Sony Walkman, an iPod and a laptop featuring Spotify. Another group examined the career of Puerto Rican actress Rita Moreno. “We learned that even though she’s such an accomplished actress, she’s had to fight through so much marginalization,” student Clara Doley said. “She took a seven-year hiatus after playing this main role in ‘West Side Story’ because people kept trying to cast her as the quintessential Latina woman. She was pigeonholed. She represented an entire community, and it basically homogenized their culture instead of allowing it to be as multifaceted as representative as it actually is. One of Goin’s favorite displays was one that explored black masculinity through film by examining themes in “Birth of a Nation” (1915), “Guess Who’s Coming to Dinner?” (1967), “Shaft” (1971) and “Menace II Society” (1993). “It was very enveloping; they used their space very well and chose their artifacts very well and had a great handout,” she said. Overall, Goin and Driscoll said they were “thrilled” with their students’ work.